Why do we travel? To Explore, To Discover, To Learn, To Experience, TO LIVE! Whether you are a frequent traveller or a dreamer with a desire – the answer is the same, isn’t it? We love to travel, we live to travel, we travel as often as we can. We love to discover new places, new cultures, new food and new ideas. AND SO WE ALWAYS SEEK OUT LOCALS TO HELP US MAKE THE MOST OF OUR DESTINATION. Think about it – who is best suited to show you their place? Imagine a friend of a friend was going to visit your home-town. This person is from a faraway land, they have never been to your country. Would you put them in a taxi and wish them well? No! You would show them your place with your eyes! You would help them to understand and experience your place like no-one else can. Not only that, but you would take great pride in doing this. When you travel you can always find local people who want to share their place with you, the traveller. Take advantage of this opportunity – I guarantee you will have a richer experience for it! We know we are going to get the most authentic experience. A local guide loves to talk and share stories of their life. Locals always know the off-the-beaten path secret spots. Support of a small local business. Our travel dollar goes straight to the person who has earned it. A local knows the best places to eat, can suggest local delicacies and things to avoid! 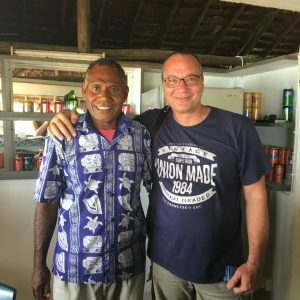 Help with local language – you will find a local guide is happy to translate for you and will willingly teach you some words in their language. A personal experience is a more rewarding way to travel. To help cruise passengers discover unique experiences at Ports: off-the-beaten path and in small groups led by passionate locals. To help small local operators to connect with Cruise Passengers, and to provide a place where they could earn what they deserve, instead of having to pay the huge commissions taken from them elsewhere. We have now developed close relationships with small local business operators who have the same philosophy towards travel experiences as we do. We know & trust our operators, and we have personally researched, tested & hand-picked the best Unique Experiences to be found. So you don’t have to! With GoBySea you can book a Unique Experience run by dedicated, passionate locals - knowing that we have taken care of all the details for you AND your dollar is going directly to the right person!